As a resident of North Carolina, it’s not often I have the opportunity to travel to the Midwest for a theme park trip. 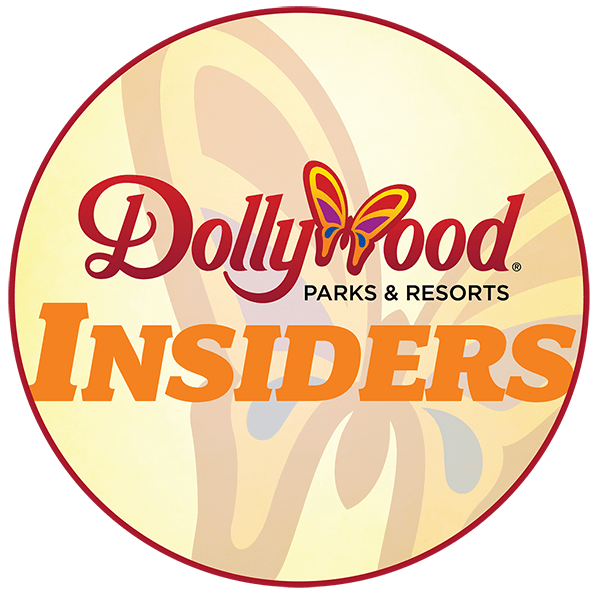 So I knew that when the Coaster101 team planned their inaugural meetup at Holiday World for the last weekend in August, I had to squeeze in a visit to another theme park in the region before I headed back home. On Sunday, August 30, I made my first visit to Kings Island, one of the former Paramount Parks acquired by Cedar Fair in 2006. 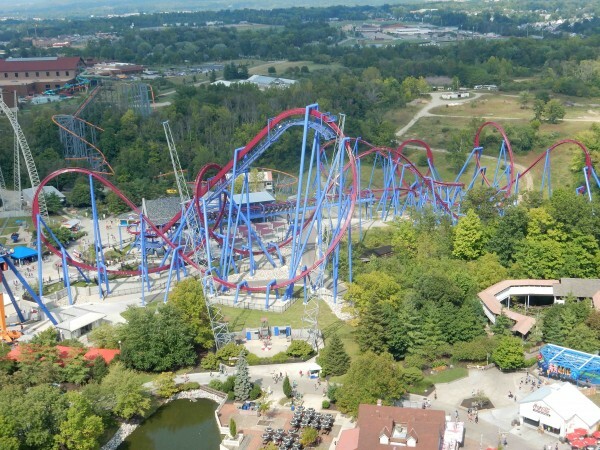 Kings Island boasts 14 roller coasters, trailing only Six Flags Magic Mountain (19), Cedar Point and Canada’s Wonderland (16 each) as the park with the most roller coasters in the world. It was my goal to ride as many of them as possible in the short period of time I had at the park before I needed to catch my flight home. With the help of a Fastlane Plus Wristband and Sunday theme park crowds, I felt this was a very attainable goal. I arrived at the park about an hour after opening, and immediately starting picking out similarities between Kings Island and other former Paramount Parks I’ve visited; Carowinds and Kings Dominion. (This proved to be a reoccurring theme throughout the day, so I’ll continue to make comparisons throughout this post.) 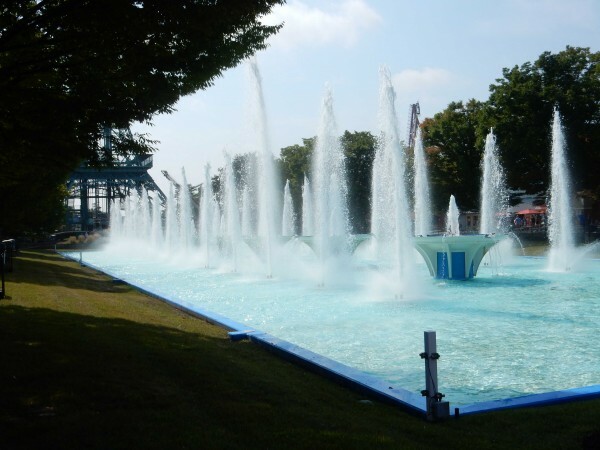 Entering the park, you’re greeted by an expansive fountain and 1/3 scale replica of the Eiffel Tower, just like at Kings Dominion. After consulting a park map, I decided to make a clockwise loop around the park, riding every roller coaster along the way. 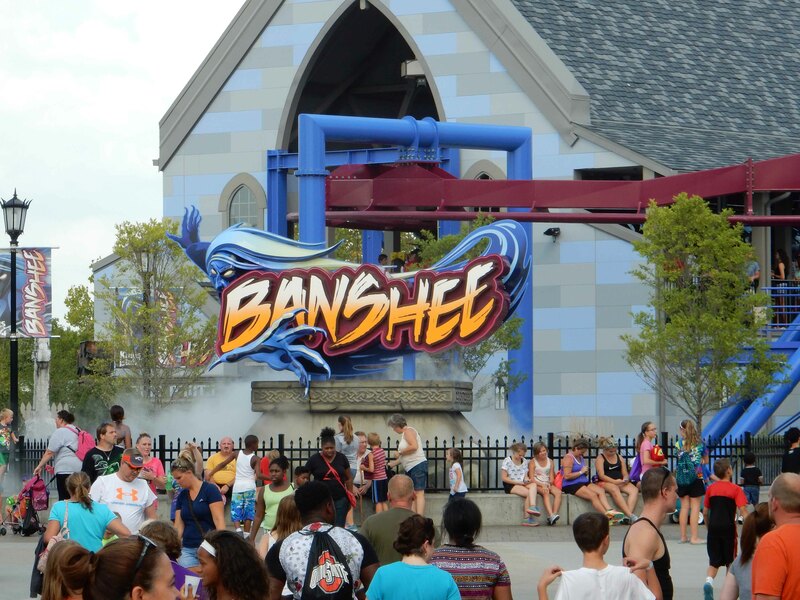 My first ride of the day was Kings Island’s newest roller coaster, the B&M Invert Banshee, which opened last year. I had read Kyle and Nick’s report from Media Day, but it takes seeing (and riding) Banshee in person to fully appreciate how great this coaster really is. The first thing I noticed was that the trains were different from a typical B&M invert, featuring seats/restraints more similar to a B&M Wing Coaster, which resulted in a much more comfortable ride. The Vekoma inverted boomerang, Invertigo, was temporarily down, so I headed over to The Bat for my second ride of the day. My clockwise tour of Kings Island continued with a ride on the park’s Arrow mine train, Adventure Express, which opened in 1991. Unlike the Carolina Goldrusher at Carowinds (another Arrow mine train), there is a good bit of theming on Adventure Express, including a final chain lift with animatronic sculptures that really caught me off guard when they started moving. 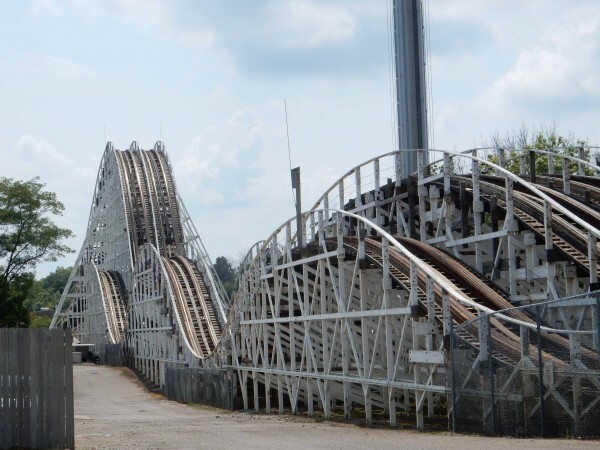 Next up was The Racer, Kings Island’s iconic racing wooden coaster that inspired similar coasters at Kings Dominion (Rebel Yell, 1975) and Carowinds (Thunder Road, 1976). Only one side of the Racer, the red side, was operational that day. I found the ride to be a little rough, but it may be the style of the seats that were digging into my ribs. It was great to ride a piece of roller coaster history and notice the differences between the Racer and the other racing wooden coasters it spawned. 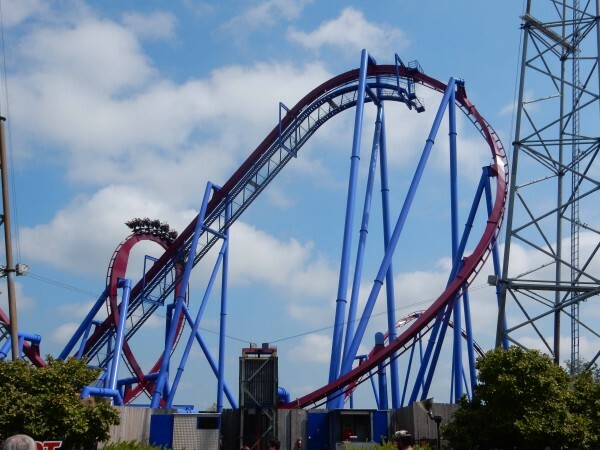 I headed under The Racer’s lift hill to the “X-Base” area of Kings Island where there are two coasters — Flight of Fear and Firehawk — that are near replicas (if not exact clones) of coasters I’ve already ridden multiple times. Flight of Fear is a Premier Rides launched coaster that opened at Kings Island and Kings Dominion in 1996. I’m assuming the rides provide the exact same ride experience, but its tough to tell since they are both enclosed in the dark, and often it’s difficult to determine which way is up while riding them. I’ve learned that sitting as close to the front as possible on Flight of Fear is the best seat, not only because the launch is the best, but you’re less likely to get whiplash than you would in a seat towards the rear of the train. The Vekoma Flying Dutchmen, Firehawk at Kings Island and Nighthawk at Carowinds, are not exact clones, but have a lot in common. 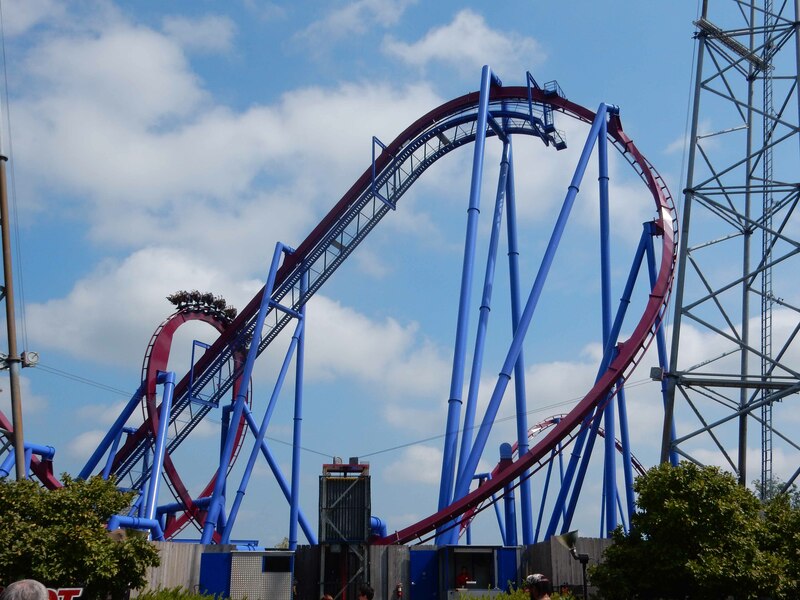 Both coasters stand 115′ tall, feature five inversions, and are both residing in their second locations. Firehawk opened at Kings Island in 2007 after it was relocated from Geauga Lake. (Nighthawk opened at Carowinds in 2004 after several years at California’s Great America.) Firehawk is nearly 600′ longer than Nighthawk, and features a dual loading station. As someone who has waited in the notoriously long line for Nighthawk at Carowinds, I loved the dual loading station at Firehawk. It definitely looked like it improved capacity. Even though the rides are so similar, and maybe I caught it on a good day, I enjoyed my experience on Firehawk more than my ride on Nighthawk earlier this season. 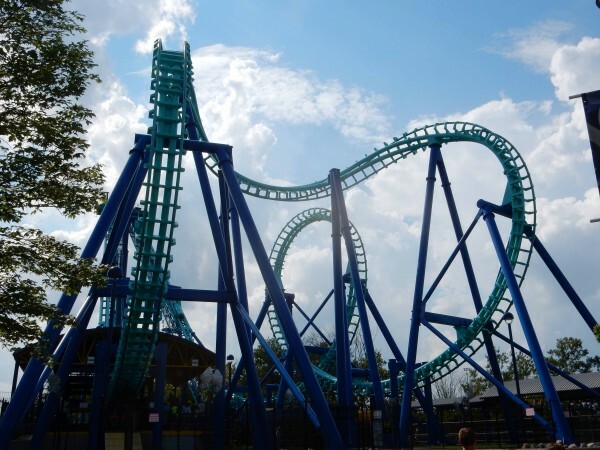 Four Cedar Fair/Paramount Parks — Kings Island, Carowinds, California’s Great America, and Canada’s Wonderland — have a roller coaster named Vortex. 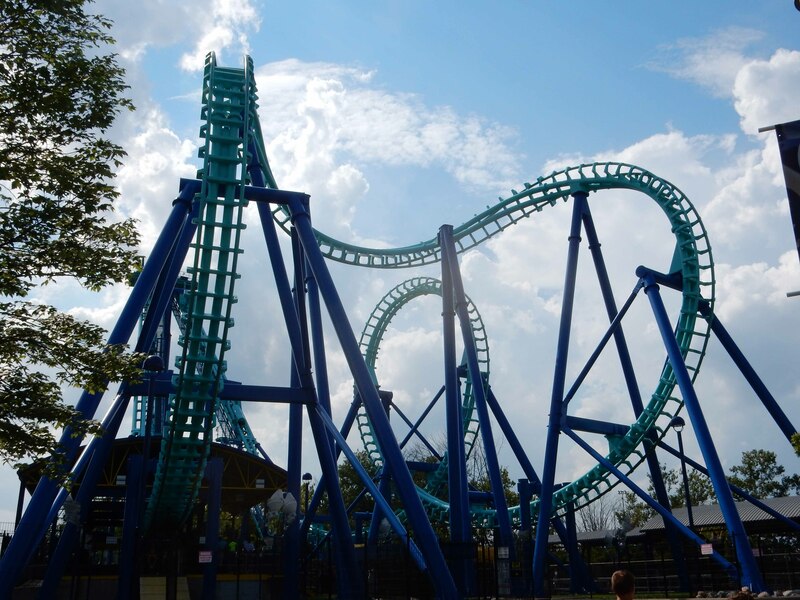 The Kings Island version of Vortex is a custom Arrow looping coaster that opened in 1987. Arrow loopers aren’t my favorite, but I had a good time on Vortex. The coaster had three great double inversion sections, with back to back loops, back to back corkscrews, and a batwing. 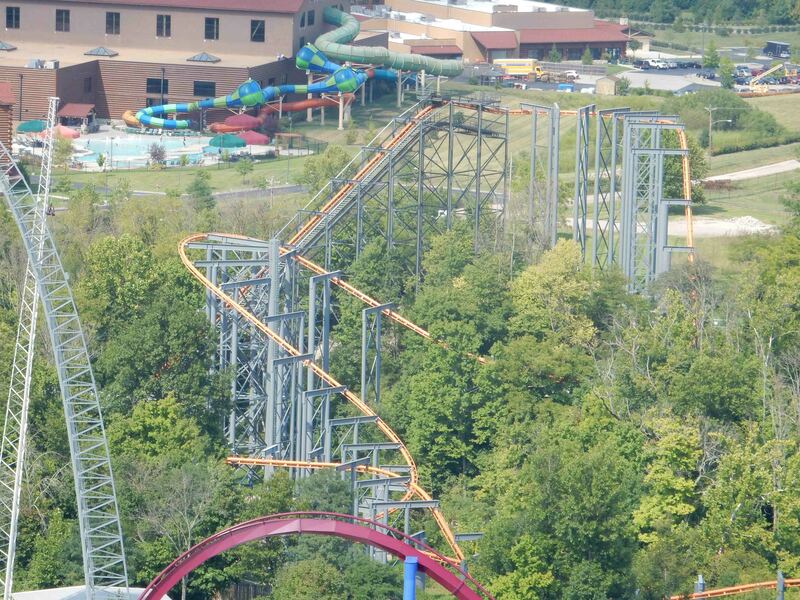 To compare it to another coaster, I’d say it’s a souped up version of Anaconda at Kings Dominion. After Vortex, I conquered my fourth Windseeker attraction. The location of the Kings Island Windseeker provided some great views of The Racer and The Beast, but was in a fairly isolated corner of the park. I think I’m finally getting over my Windseeker anxiety where I no longer have to “white knuckle” the restraints, which is always a good thing. 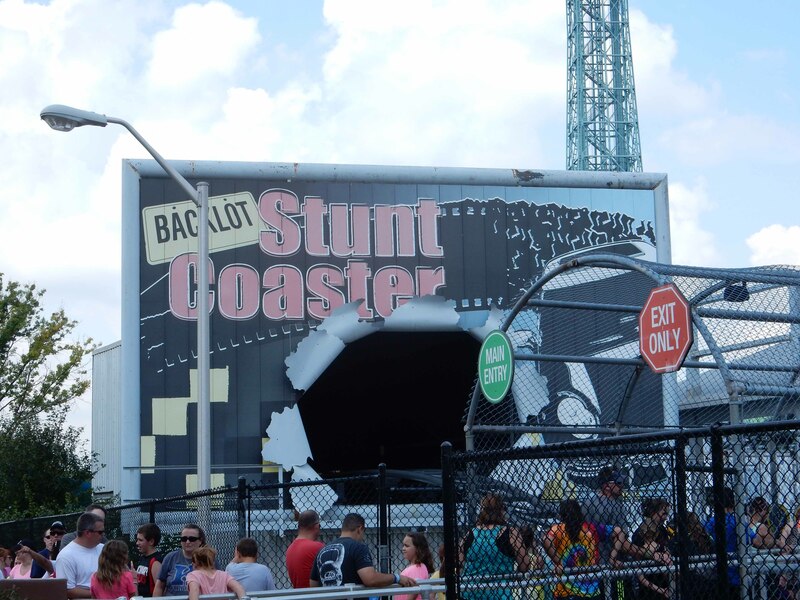 Another Kings Dominion clone, Backlot Stunt Coaster was my next coaster. 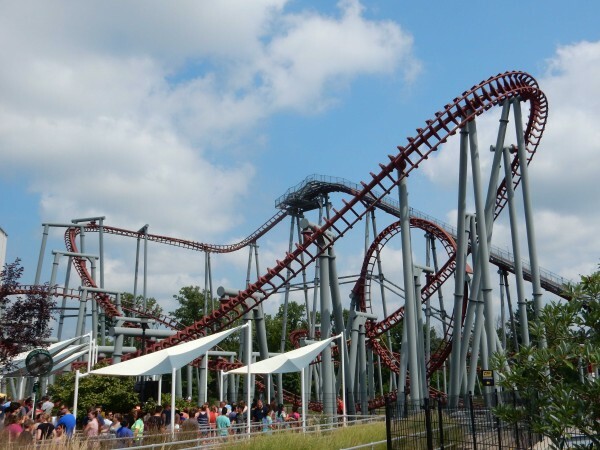 It’s been a few years since I’ve ridden the Kings Dominion version, but the main difference I noticed was that all of Kings Island’s effects on this coaster were working, while many of Kings Dominion’s were not. (It’s very possible that I caught Kings Dominion on a bad day, though.) This coaster is a great coaster for families, and provides a nice transition to “bigger” coasters with its 40 mph LIM launch. 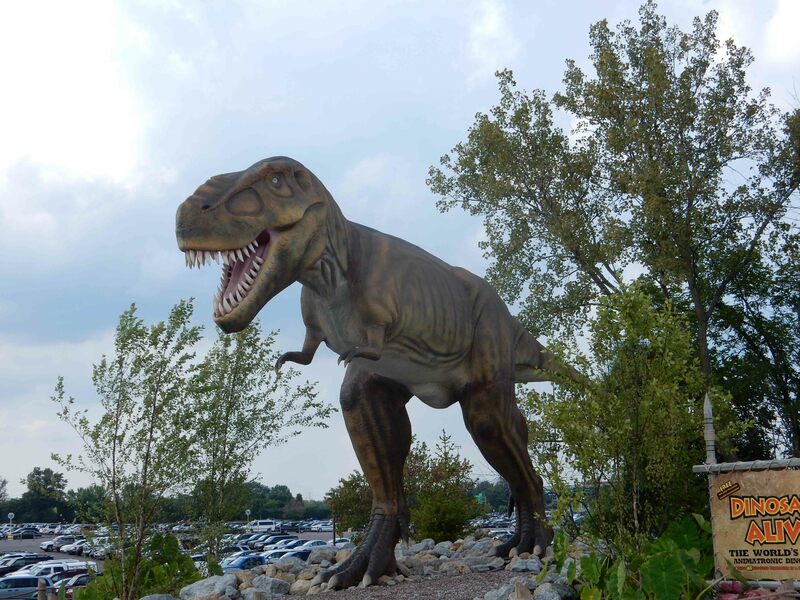 When I told people I was going to Kings Island, everyone seemed to have the same advice; “Ride ‘The Beast’ at night.” Unfortunately, my travel plans weren’t going to accommodate these instructions, so I settled for a few rides in the afternoon. 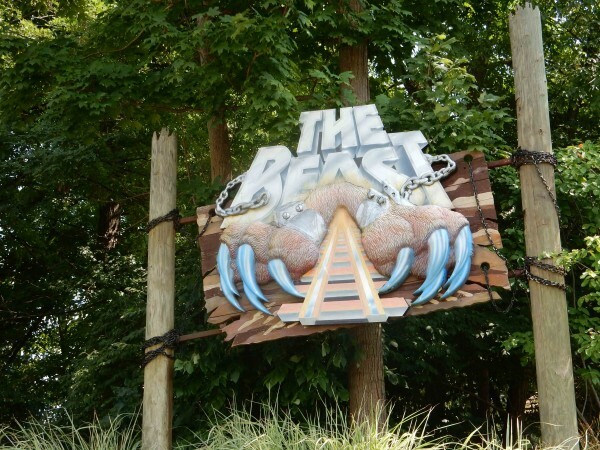 At 7,359 ft., The Beast is the longest roller coaster in the United States, and it packs a punch from beginning to end. I loved flying through the woods and over the terrain, and can definitely see why people suggest riding it at night. Riding The Beast less than 24 hours after riding Holiday World’s three wooden coasters definitely added to the new perspective on wooden coasters I’d developed the day before. 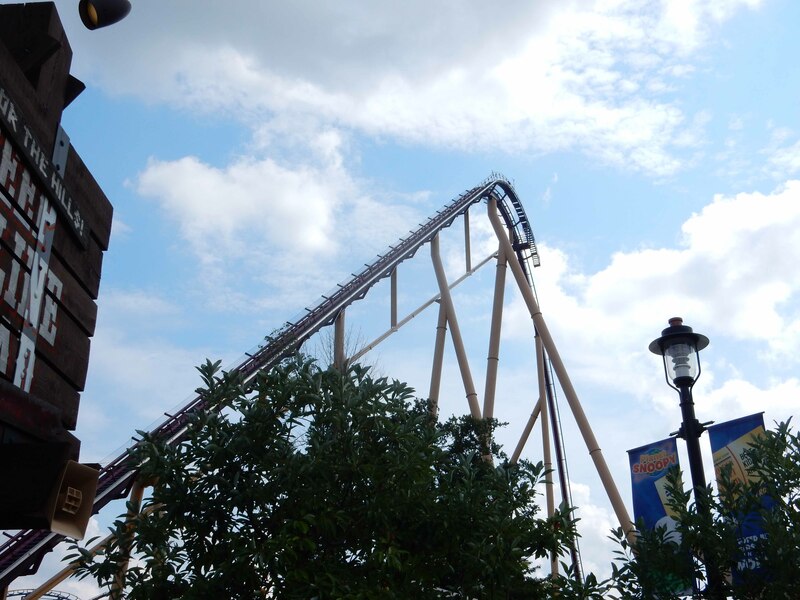 Kings Island’s B&M Hypercoaster, Diamondback, had been sitting at the top of the lift hill for most of the morning and afternoon, and I hadn’t seen it in motion with riders all day. When I saw three trains stacked in the station and brake run, I knew that my chances were slim to ride that day, especially on a time constraint, but I didn’t let that deter me. 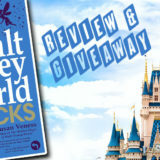 I turned to Twitter for a bit of a “Choose Your Own Adventure” for my next coaster. As you can see, with a score of 7-2, I was obligated to head into Planet Snoopy for rides on the Flying Ace Aerial Chase and Woodstock Express, both of which I’ve ridden versions of before at Carowinds and Kings Dominion. 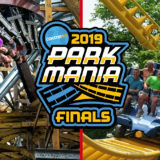 Neither are the most intense roller coasters out there, but much like Backlot Stunt Coaster, they’re great coasters for families and for those who may need to “work their way up” to the big rides like Banshee, The Beast, and Diamondback. 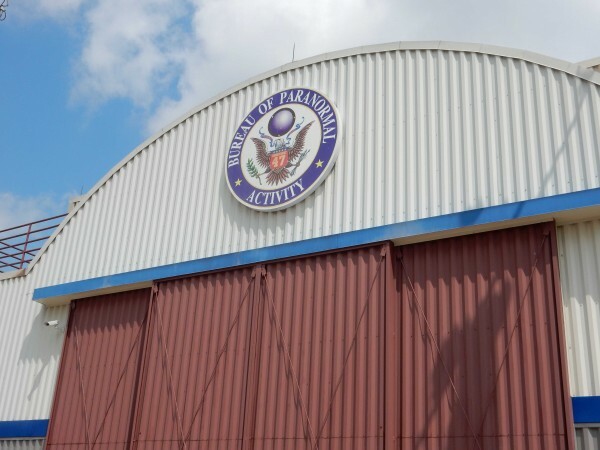 It was in Planet Snoopy where I had a taste of Kings Island’s famous “Blue Ice Cream.” I’m not usually a soft serve ice cream fan, but the Blue Ice Cream had just the slightest taste of blueberry, and it was really good. 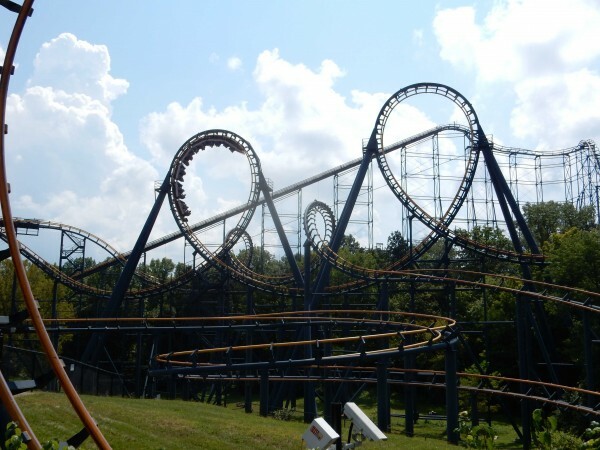 I had almost completed the full clockwise loop of Kings Island when I arrived at the Eiffel Tower. I like towers like the Eiffel Tower where you can take your time at the top instead of the traditional observation tower that takes you up and down inside of a vehicle in the span of about a minute or two. The 360-degree views from the top were amazing. I snuck a peak at Diamondback from the Eiffel Tower, and it didn’t look like it was going anywhere anytime soon. I had time for one final ride of the day, so I headed back to Invertigo, which was back operating. It was the first time I had ridden on a coaster with seats that face both forward and backward, which creates the potential for some awkward eye contact. I liked Invertigo better than a standard sit-down Boomerang coaster, but I’m still not used to the feeling of taking inversions in reverse, especially in quick succession. I’m sure I’ll adapt at some point, though. I had a flight to catch, and with twelve new roller coaster credits to add to my repertoire, I could call the day a success. As I was getting on the highway, heading south towards the Cincinnati airport, I caught Diamondback making a test run. 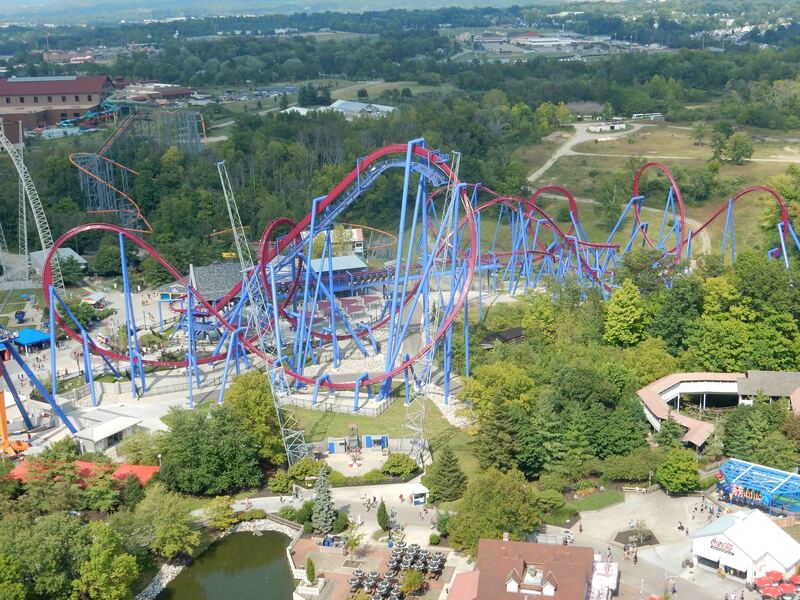 I guess I’ll have to make another trip to Kings Island to come back and ride it. 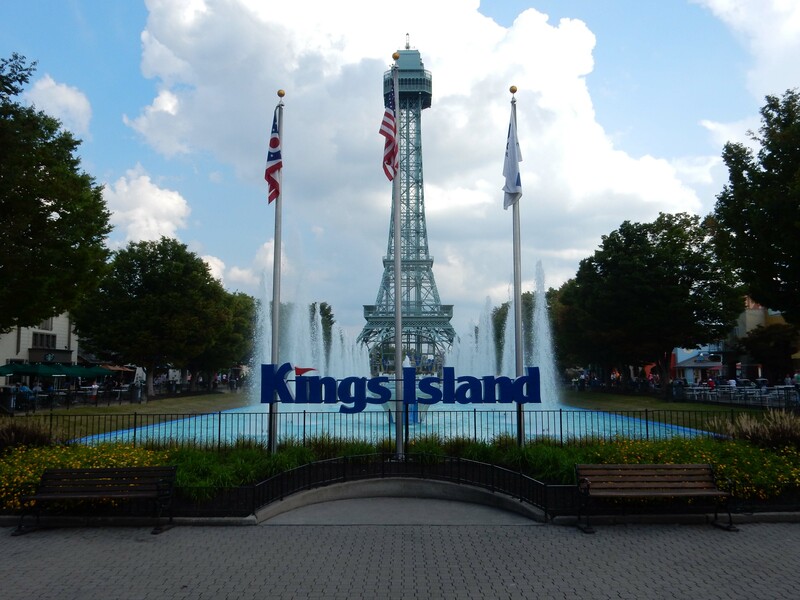 Have you been to Kings Island? What’s your favorite coaster there? Let us know in the comments below! This park was my home this summer. I worked in ride/auto maintenance in the park all this summer, so I spent a lot of time in park. Sorry you missed Diamondback but sounds like you had a good trip. I think that the bat/ top gun is defiantly one of the hidden gems in the park. Also, Adventure Express is very good too, it is my all time favorite mine train. My favorite coaster there is the Beast (at night). It is a totally different ride after dark. So after riding the two biggest legends of wood coasters ( The beast and the Voyage) can you pick a favorite? @Jeremy — If I *had* to pick, I’d give the slight edge to the Voyage, just because with some of the airtime, I was almost standing in my seat under the restraint — never felt that before in a wooden coaster.